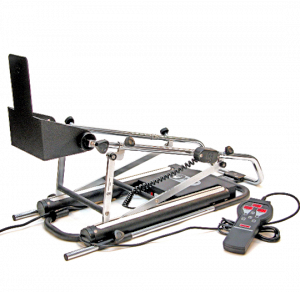 Knee CPM 1850™ combines durability with ease of operation. Each device is made of mild steel construction and built to withstand the rigorous hospital and home health environments. The full featured CPM offers an easy to comprehend digital display pendant, bariatric accommodations and space-saving tripod position. The Knee CPM 1850™ provides proper anatomical therapy, accurate range of motion and ultimate comfort for all patient types. Attention to detail and craftsmanship that goes into constructing each machine by hand in the USA. 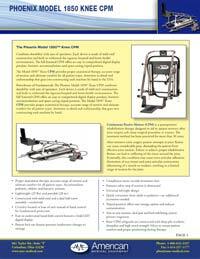 Powerhouse of Fundamentals, the Knee CPM 1850™combines durability with ease of operation. Each device is made of mild steel construction and built to withstand the rigorous hospital and home health environments. The full featured CPM offers an easy to comprehend digital display pendant, bariatric accommodations and space-saving tripod position. The Model 1850™ Knee CPM provides proper anatomical therapy, accurate range of motion and ultimate comfort for all patient types. Attention to detail and craftsmanship that goes into constructing each machine by hand. Constructed with deep pile synthetic sheepskin and high tensil strength Velcro to ensure patient comfort and proper positioning during therapy. Remove the KNEE CPM 1850™ from the container and slide the Foot Cradle Assembly out. 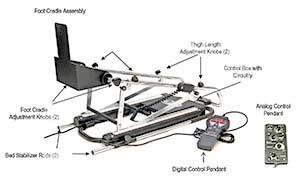 Loosen the large knobs on the Foot Cradle Assembly and position in the upright position. Tighten knobs. Determine the length of the patient’s femur by measuring from the greater trochanter (hip joint) to the center or joint line of the knee. Transfer this measurement to the thigh cradle beginning approximately 1.5 to 2 inches away from the hip pivot assembly measuring to the knee axis of the unit. Adjust the thigh cradle to match this measurement by loosening the thigh adjustment knobs and sliding the thigh cradle to the proper length. Note: The DC2480 maximum cradle adjustment is 3 inches. Do not extended beyond this point. If patient’s thigh length exceeds these measurements, simply increase the beginning point of measurement to 4 to 6 inches away from the hip pivot assembly. 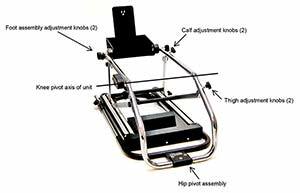 Loosen the calf cradle adjustment knobs and extend the foot assembly. Do not remove this assembly -- only slide far enough for patient placement. Position the patient's leg in the unit, with soft goods in place. Slide the foot assembly toward patient accordingly leaving one half inch gap between the patient’s foot and the foot plate. Tighten the calf cradle adjustment knobs securely. The foot assembly may be adjusted in plantar flex or dorsi flex positions. Loosen the adjustment knobs on the foot assembly, adjust the foot plate to the desired positioning and securely tighten the adjustment knobs. The ON/OFF switch is located at the base of the black control box. When the unit is powered ON it will beep one (1) time and the hand-held control pendant will illuminate. This indicates that the unit is ready for use. 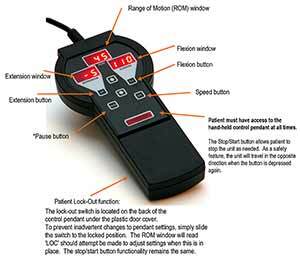 To set Flexion range: Depress the FLX button and the up or down arrow simultaneously. To set Extension range: Depress the EXT button and the up or down arrow simultaneously. A 5 degree difference between flexion and extension is required for normal operation. Should the angle settings be too close the incorrect setting on the pendant will flash. To set Speed: Depress the Speed button and the up or down arrow simultaneously. When you depress the Speed button, the setting will appear in the ROM window. To set Pause: Depress the Pause button and the up or down arrow simultaneously. When you depress the Pause button, the setting will appear in the ROM window. Patient Compliance Meter: The patient compliance meter monitors patient usage and tracks in tenths of an hour readings. Example: 25.4 reading = 25 hours and 24 minutes.